Finally, some acknowledgement of what is going on with the website. I hope it gets cleared up soon. This is getting kind of ridiculous!! They have a loyal customer base that knows when their products roll out, they already have enough past issues to deal with, and they are just now trying to do this whole rebranding "feel" BS. Get your act together here! 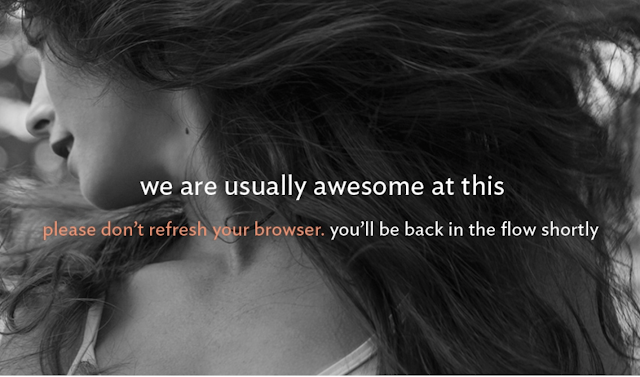 That moment when your realize that everyone knew your website was down ......except for you! I'm a bit perplexed that they didn't know there was a problem until long after upload should have happened and customers started bringing it to their attention. Is anybody manning the ship? That's what I was just thinking, Lulubelll!! @ Amy T - I agree. @Sophie - It almost seems like it is not. Just read the newest version.. "We're usually awesome at this".. Not recently lululemon..get it together! 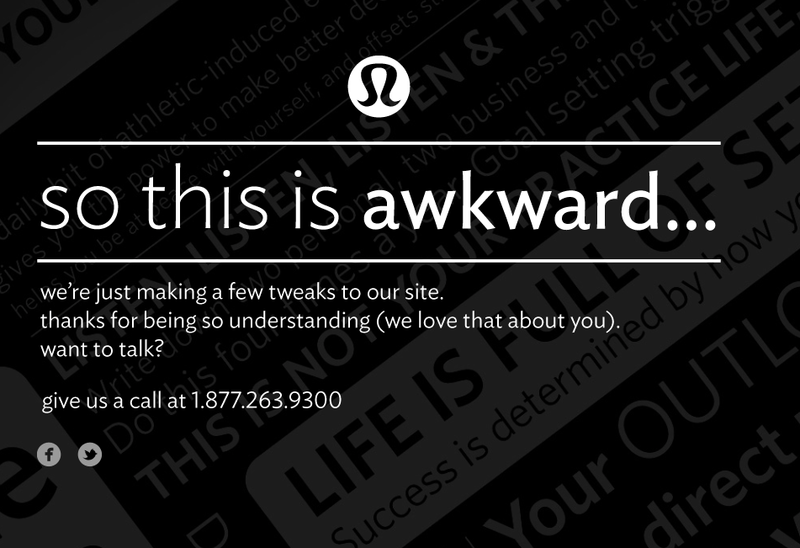 My prediction is that Lululemon will become like Abercrombie & Fitch (Where a shirt used to cost $40 now it's like $9.99) It's going downhill from here (quality is not as good as before, price still going up now the site is not working on an upload day!?!?). Mark my words! This is annoying considering, I woke myself up at 1AM to order something from this upload. And they didnt even bother to check that the website wasnt working. So disappointing considering they are fully aware of us lulu fans that base our lives around this upload. Im starting to lose interest in this brand. @Anon 6:27 - that's hilarious! I remember the old days when Abercrombie was 'premium' preppy collegiate wear. Now everything's perpetually on sale and the quality is appalling. Maybe there is a surprise for us... or someone kicked a cable when they were doing an Ardha Chandrasana. Ha!!! I've thought this from my first days shopping at lulu! I worked at a&f for 5 years during its prime and everything about lulu reminds me of it then. The brand having its own "lifestyle," strange marketing photos and videos, and the obsessive entitled shoppers.... Offensive comments from CEOs... Lol I totally agree with your prediction. Not necessarily a bad thing but i definitely see it running its course. Dum de dum... Just twitling my thumbs in between website refreshes. I should just call it a night, but I can't! I love and hate you Lulu!!! "We're usually awesome at this" Really? You know who is usually awesome at this? EVERY OTHER E-COMMERCE SITE IN THE WORLD. The fact that Lulu wasn't aware there was a problem, coupled with the fact that they've now had to disable the website and we've gone hours without an update suggests a hacking - or attempted hacking - to me, though I hate to speculate. I hope I'm wrong. My cynical side thinks that this delay is a deliberate idea to create a little drama, with the intent to keep loyal customers waiting and refreshing and chomping at the bit so when it finally goes up we'll start buying with unbridled frenzy. @ Sophie - my husband thought the same thing - the fact they're asking people not to refresh suggested a DNS - a denial of service attack - to him. That's DOS, DNS is domain name system. @Starfighter - right, total brainfart. It's probably athleta, lol. @LuluAddict Absolutely. I'm not an expert, but that would be my guess too. My understanding is hackers tie up the server by repeatedly accessing it...so they wouldn't want users constantly refreshing either because it would overwhelm the server. It's not easy to stop these attacks, so I'm not holding my breath for this upload. @Starfighter She's right that it's DNS. If you look up DDoS attacks (Distributed Denial of Service attacks), you'll find out more info. @Sophie - I can poke around the website now provided I don't go through "What's New" for women. I don't see any new items, though. It just seems the What's New pathway is broken. @LuluAddict Interesting, just before I posted my last comment, I was getting the error page when I tried to access the home page. Now I can access the main pages, but if I try to click on any detailed product page, I get the error. And you're right the "What's New" pathway doesn't work either. Also I'm noticing my error page is auto-refreshing at irregular intervals now which doesn't make sense to me, considering it says "Please don't refresh your browser". But perhaps that's a malicious script? I don't know - again, this is all speculation. Was this intended to be a 'special' upload? I didn't see anything special or enticing about this week's WWL. I associate website crashing with too much activity (not saying this is correct by any means)? @ anon 8:51 pm - the website was kind of wobbly last week at upload time - it took awhile to come on line, but nothing like today. There was nothing that was really highly anticipated, as far as I can tell. I think it's "kind of" fixed now. I can see the old "new" stuff and see the inventory. It's finally up...a lot of drama for not much. They seem to have fixed the issue. New items now visible for both US & Canada. Woke up just now to find the site is back up. Going right back to sleep as that upload was not worth waiting so long for...nothing for me. Guys I doubt it's hackers or anything seriously nefarious. IT systems occasionally break down. It doesn't mean they're abandoning their loyal fan base or trying to alienate anyone. It's a computer and network built by humans. And we all err. So the systems we build err too. Deep breaths. The yoga pants will return. At least the color descriptions under the item photo work again. @ 11:44 pm - I agree - a very blah upload. I literally got bored waiting and bought two capris from athleta instead. Does anyone know if athleta energy chat capri is similar to lulu's wee are from space fabric? Thanks for the input! Agreed with Caitlin....sometimes, computers fail. Think about how many times technology has failed you. They aren't evil and it probably wasn't on purpose. I am sure they still want your money and you'll undoubtedly still give it to them. "So disappointing considering they are fully aware of us lulu fans that base our lives around this upload. Im starting to lose interest in this brand." ...to the person that wrote that, wow, that's one of the most sad things I have every heard. That. Is not. Much. Of. A. Life. And agreed. Nothing "nefarious" at play here. If you can't wait or detach for one bloody second or hour(s), I'm sorry to say you have "issues" if you're that obsessed. Yes, written fully aware this is an "addict" board. It's nice to know that I'm pretty sane. I really appreciate LLA's hard work to keep people informed and highlight the gear available or coming. I don't wait on uploads, I really don't check them (I look a bit and then shop mostly in store, but appeal of the brand is lessening for me). So what the system was down. Not even a blip in my life. Whateve.